There are indeed times when late is better than never. Take private activity bonds as an example. Tax policy authorizers in the U.S. House pushed a bill that had dropped the infrastructure financing tool, panicking the transportation community. Senate authorizers kept the exemption, which paved the way for Republican negotiators to ultimately unveil a final tax overhaul Dec. 15 with the financing tool. Republican leaders and President Donald Trump really banked on wrapping up tax reform by year’s end, to clear the deck for infrastructure in 2018. The GOP tax bill is scheduled for a vote in the House on Dec. 19. House passage will lead to a vote in the Senate soon after. “Private activity bonds are important financing tools in a wide range of projects from hospitals and schools to airports and local water facilities. There are currently well over $10 billion in PABs issued for a variety of projects across the country. The demand for them is there,” said Rep. Sam Graves (R-Mo. ), chairman of the Highways and Transit Subcommittee. Graves had led a group of House lawmakers in calling on tax policy authorizers to maintain the tax-exempt bonds. The American Association of State Highway and Transportation Officials was among the infrastructure stakeholders that urged lawmakers to reverse the House’s position. “Serving as an important infrastructure financing tool that attracts private sector investment to public-purpose facilities, [private activity bonds] have catalyzed successful financing of large transportation projects across the country,” Bud Wright, AASHTO’s executive director, said Dec. 8. Local governments rely on the exemption to finance big-ticket infrastructure projects. Dec. 20, 10:30 a.m.: The Senate Environment and Public Works Committee hosts a hearing on the status of freight movement in the country. American Trucking Associations President Chris Spear is among the witnesses. ELDs: With the federal electronic logging device mandate now in effect, some freight brokers are surveying their carriers about compliance with the rule, taking a proactive step now to help prevent supply chain disruptions later, logistics executives said. WREATHS: American Trucking Associations and ATA’s Share the Road Highway Safety Program celebrated the arrival of the Wreaths Across America convoy at Arlington National Cemetery in Arlington, Va., on Dec. 16. CSX: Hunter Harrison, the railroad-turnaround specialist whose career spanned more than 50 years, has died just two days after CSX Corp. announced the CEO would take a medical leave of absence. Opposition from senior Democrats on the White House’s yet-to-be-revealed infrastructure plan could ensure a long-term funding fix for transportation projects does not advance in 2018, senior Hill aides have told Transport Topics. If you, as a state or local elected official, are willing to create a new revenue stream for infrastructure, we, as the federal government, want to partner with you in doing that. D.J. Gribbin, White House infrastructure adviser, at the Hudson Institute on Dec. 12. Forget Xmas. Call it Taxmas (kudos to The Wall Street Journal’s Richard Rubin). The great state of New Jersey gets a lovely ‘happy birthday’ from Sen. Cory Booker (D), ranking member on the trucking subcommittee. 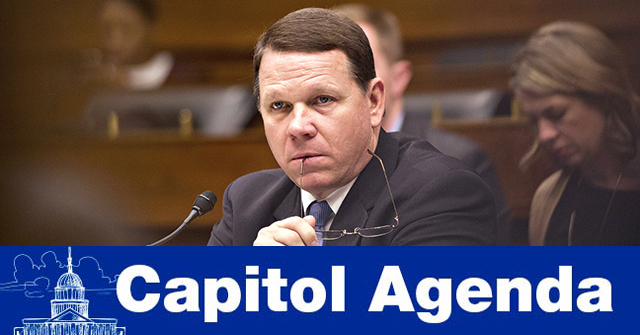 Thank you for reading Capitol Agenda. We publish Tuesdays when Congress is in session. E-mail emulero@ttnews.com with tips. Follow @eugenemulero and @transporttopics on Twitter.